Moments With Kemi Gwan: LOVE & JEALOUSY.. I have been learning about some things recently. I realize how easy it is to dismiss and say, that’s not me when in actual fact it is me, it is you, it is us.. not the other person, not the unbelievers..
Love between two siblings could get sour real quick if something called success or preference for one, becomes evident. I’m your loving sister until your elevation or opinion appears more important and mine is ignored. 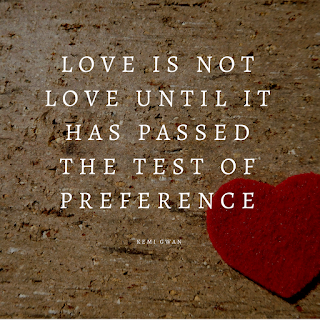 Love is not love until it has passed the test of “preference”. Variables like success, promotion, money, fame etc shows up in a person’s life or their relationships to test who they really are.. When the one thing you desire the most at every level, falls in the lap of someone else, someone close to you, what’s your reaction? It could be affection, promotion on the job, a position or respect.. When you see the respect given another, do you think 🤔 that should be me? When the promotion you had been vying for is given to another, do you distance yourself? Many friendships fall out because of jealousy, not because of love. A difference in opinion is a big challenge and it takes love to prefer another’s opinion. If I prefer you and you prefer me, there will be no room for competition. Many people are unknowingly building relationships on a competitive foundation. You have a husband, I too will go and get married. You now have a job, I too need to belong to this group of “successful” young people. Success (an appearance of wealth, a problem/struggle-free life) Etc. The person that finds self-validation in these shallow attributes, is very likely to quickly embrace jealousy. Leah and Rachel were cool sisters until they had to share one man’s affection. Cain and Abel were close brothers until God preferred one’s sacrifice over the other. King Saul loved David until the people he led, sang David’s praises higher than his own. The disciples fought each other strangely about who deserved to sit next to Jesus when Jesus takes his seat in the Kingdom of God. Do you see that it is human nature to seek glory for itself, to be competitive in opinion, in success, even in love? Jesus beat that nature by submitting to God to receive that glory. The devil in all his glory was infected with this same disease. The rebellion started in heaven. When humans fell into this same error, we also became self seeking, glory seeking. Just because you give your life to Christ doesn’t autocorrect this sinful nature.. I am encouraged because the more I follow the Holy Spirit, the more I become like Jesus and the more I become like the father. 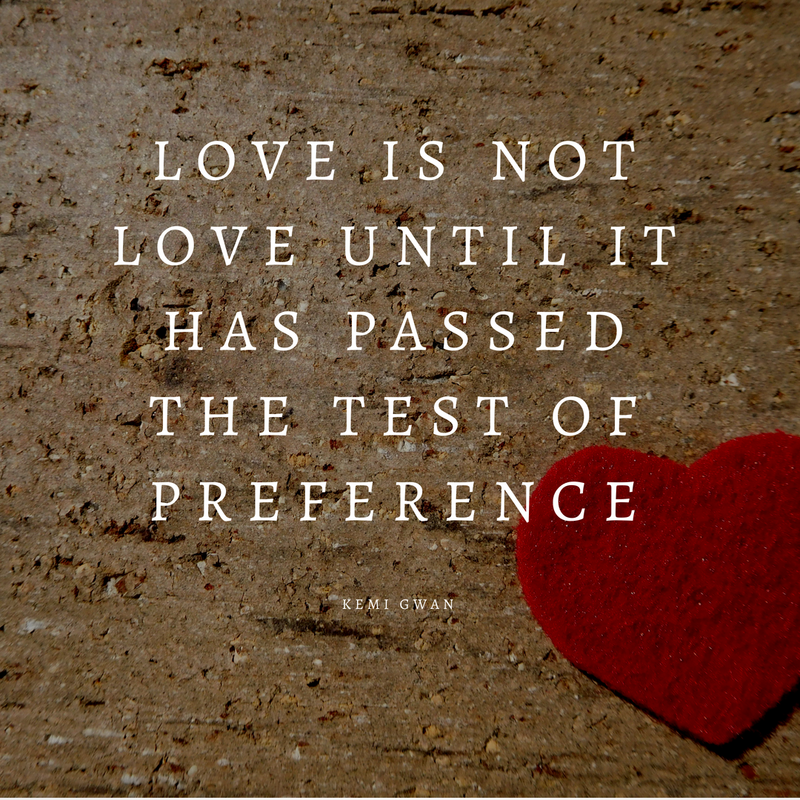 When I wake up in the morning, I examine my relationships, my husband, my family, my friends, my church members and members of my prayer groups.. do I love them enough to prefer them? Check your heart today! Be transformed once more! Love is real but so is jealousy. Don’t just gloss over it, check your heart, is your love pure? Or is it tainted by jealousy?